Audio company Sonos today announced a new range of speakers called "Sonos Architectural by Sonance," which are a collection of passive speakers that are designed for both indoor and outdoor use. There are three new speakers total: the Sonos In-Ceiling, Sonos In-Wall, and Sonos Outdoor Speaker. As their names imply, the first two speakers are designed to be placed within the walls or ceilings of your home, sitting flush with each surface. Sonos says it worked with Sonance to make sure each speaker blends into any space while still providing the clear sound, even coverage, and performance expected of a Sonos device. These connect with Sonos Amp to use the company's "TruePlay" feature that detects the size, construction, furnishings, and more of a room and adjust the EQ for optimal sound. Sonos notes that TruePlay will only be available for the In-Wall and In-Ceiling speakers. For the Outdoor speaker, Sonos says this is its first device specifically built for outdoor use, featuring a weatherproof build that was engineered to withstand various environmental conditions. 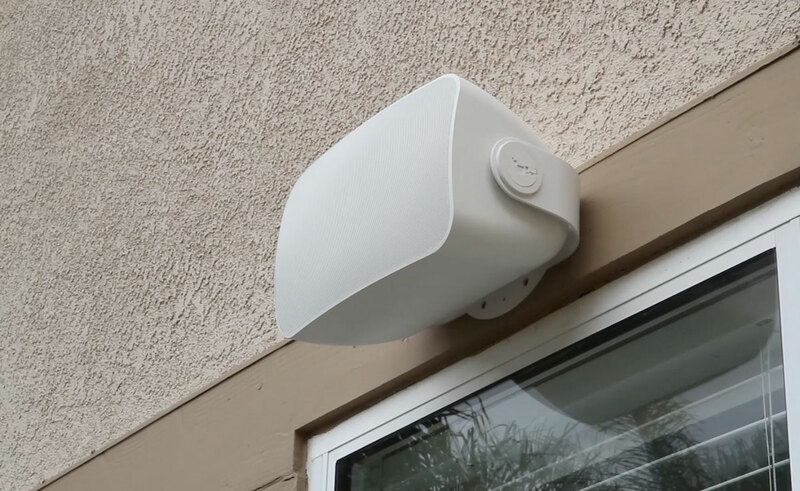 The Outdoor speaker can also be installed on walls, but it does protrude from the surface unlike the In-Wall speaker. The In-Ceiling, In-Wall, and Outdoor speakers all support AirPlay 2 and Apple Music streaming, like existing Sonos speakers. The In-Ceiling and In-Wall speakers are priced at $599 for a pair of each, while the Outdoor speaker costs $799 for a pair. The two Sonos Architectural speakers are available for pre-order today and will launch on February 26, while the Outdoor speaker will not be available until April. Sonos today also announced that the updated Sonos Amp is now available for purchase in Australia, Canada, and Mexico, and it will launch in Europe on February 12. During its original launch last year, the new Sonos Amp was only available in the United States. Note: MacRumors is an affiliate partner with Sonos. When you click a link and make a purchase, we may receive a small payment, which helps us keep the site running. Wow, seems pretty spendy for some passive speakers that still need you to buy a Sonos Amp to make them work. How many are going to miss that little detail when ordering? Audio company Sonos ('http://www.anrdoezrs.net/links/462641/type/dlg/https://www.sonos.com/en-us/home') today announced a new range of speakers called "Sonos Architectural by Sonance," which are a collection of passive speakers that are designed for both indoor and outdoor use. There are three new speakers total: the Sonos In-Ceiling, Sonos In-Wall, and Sonos Outdoor Speaker. These can connect with Sonos Amp to use the "Trueplay" feature that detects the size, construction, furnishings, and more of a room and adjust the EQ for optimal sound. The In-Ceiling ('http://www.anrdoezrs.net/links/462641/type/dlg/https://www.sonos.com/en-us/shop/ceiling-speaker-pair.html') and In-Wall ('http://www.anrdoezrs.net/links/462641/type/dlg/https://www.sonos.com/en-us/shop/wall-speaker-pair.html') speakers are priced at $599 for a pair of each, while the Outdoor speaker ('http://www.anrdoezrs.net/links/462641/type/dlg/https://www.sonos.com/en-us/shop/outdoor-speaker-pair.html') costs $799 for a pair. The two Sonos Architectural speakers are available for pre-order today and will launch on February 26, while the Outdoor speaker will not be available until April. Sonos today also announced that the updated Sonos Amp ('http://www.anrdoezrs.net/links/462641/type/dlg/https://www.sonos.com/en-us/shop/amp.html') is now available for purchase in Australia, Canada, and Mexico, and it will launch in Europe on February 12. During its original launch last year, the new Sonos Amp was only available in the United States. When you have to rip your speakers out of the wall because you bought a bigger TV. Claiming they support airplay and Apple Music is misleading. All they did was partner with a speaker company for passive speakers. Am I missing something? Do a pair of these speakers include an amp? Saying these speakers support AirPlay 2 is like saying my mother could be a wagon, if she had wheels. Any speaker connected to the Sonos amp can be used, as that functionality is inside the Amp not the speaker. No I think pretty much everyone here understands exactly. Do you claim your Bose in ceiling speakers are Airplay 2 compatible? Because that is pretty much what is happening here. These are just passive in wall/ceiling speakers hooked up to an amp that is Airplay 2 compatible. Nothing about the speakers themselves has anything to do with Airplay 2. Only the amp deals with Airplay 2 compatibility. For these speakers to truly be Airplay 2 compatible they would have an amplifier and bluetooth/WiFi built in to talk to your home router. They would need to be battery powered or hook up to an AC power source inside your wall/ceiling. I think a lot of people would be interested in that, but that is not what these speakers are. Think a lot of people don't get what these are for. Eg my house. I have a pair of in ceiling Bose speakers which wire back to a Sonos connect amp. These are outside in an alfresco area we use to entertain. Why not just got a play one outside you say? Well that's not weather proof plus it has to be plugged into power. By using a set of passive speakers + amp I can use Sonos app to send music outside without seeing any speakers. Looks fantastic and I always get asked where the music is coming from. Does it come with the amp? Otherwise, they don’t support AirPlay more than any other speaker.